Prime Minister Trudeau travelled to Europe this week, in part to be there when the European Parliament voted on CETA, the Canada-EU Comprehensive Economic and Trade Agreement, Tuesday morning. Just under two-thirds of MEPs voted yes, which means CETA can come into force provisionally as soon as ratifying legislation receives royal assent in Canada. Interestingly, a poll came out today showing only 55% of Canadians approve of the deal—down considerably from 80% support in principle at the beginning of the negotiations in 2010. For the whole package to apply, including CETA’s controversial investment court system, all of Europe’s three-dozen national and regional parliaments must also sign off, which is far from a certainty at this point. Public protests against the deal over the past two years have been the largest Europe has seen since perhaps the anti-war marches of 2001. The centre-left Social Democrats mostly voted for CETA today, but many French and U.K. S&D MEPs sided with the broader labour and environmental movement in opposing CETA. That fight now moves to the national level. The fact that the investment court system will not come into force now (or possibly ever) is a victory for the critical voices in Canada and the EU who oppose investor-state dispute settlement (ISDS). Despite the official view that CETA “fixed” the biases and ambiguities in the ISDS system, the investment court merely offers a few procedural improvements while acknowledging all the same rights offered multinational corporations and foreign investors to challenge public interest decisions affecting their profits. Canada had originally put ISDS on the negotiating table, with half-hearted pushback from the European Commission. It is satisfying Canadian negotiators lost this point in the final deal. The non-application of CETA’s ban on camcordering movies—another strange Canadian request—is also kind of funny. This was the Harper government’s only counter-proposal in an intellectual property rights chapter that otherwise imposes EU norms and preferences, including costly patent extensions, on Canada. Canada’s parliamentary process is highly deficient, as recorded in a recent Senate foreign affairs committee report on the federal government’s trade policy. Parliamentarians are given a fait accompli at the end of negotiations, asked to debate it for a few weeks in the House of Commons and told they can only make recommendations at the committee stage. But there is no way to alter deals like CETA once they’ve been signed. If the Trudeau government sends CETA ratifying legislation to the Senate for consideration, the foreign affairs committee ought to hear from witnesses on the pros and cons of the deal. It was good to see the NDP, Bloc Québécois and the Green Party vote against CETA in the House of Commons, as many of their social democratic and green counterparts did in Europe today. 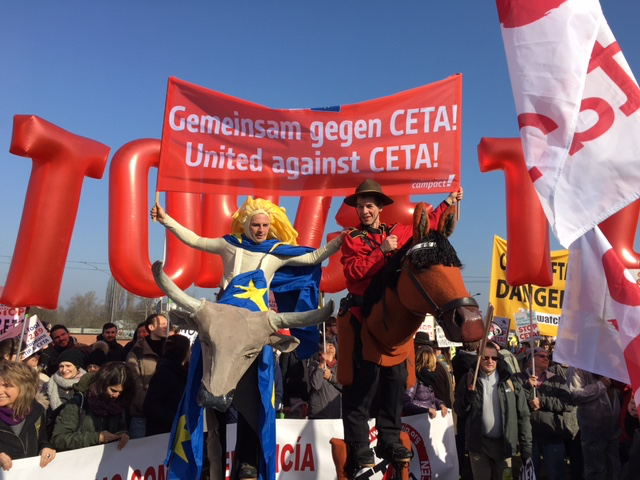 CETA mostly benefits multinational capital; its environmental, labour and sustainable development chapters, on the other hand, are nearly toothless. That might be because CETA was negotiated by Canada’s most right-wing government in recent memory, and the deal was barely changed by the Trudeau government before it finally signed off in the fall. By far the strongest voices against CETA in Europe and Canada are from progressive organizations – labour unions, environmental groups, consumer watchdogs, progressive political parties, etc. Trudeau somehow managed to spin Harper’s deal, which was written by and for multinational corporations, as a progressive, “gold standard” agreement for the middle class. In reality, the rules therein — which put absolute constraints on government policy flexibility in areas, including the regulation of financial and public services, only tangentially related to trade — are expected to contribute to inequality. These rules includes a regulatory cooperation chapter—the first in a modern trade deal—that gives corporations a seat at the table at the earliest stages of regulatory development. Not surprisingly, Canada’s mining, energy and chemicals (pesticides and GMOs) sectors were among the loudest cheerleaders for CETA and the defunct Trans-Pacific Partnership. Once CETA comes into force provisionally in Canada, its most important impact will be the large increase in the cost of pharmaceutical drugs. Eventually, CETA will add up to $850 million to the annual cost of medications—a bill that will be picked up by consumers and public health plans—by extending patent terms beyond international norms. This was a unilateral concession to the EU and brand-name drug companies on Canada’s part. The costs of this concession completely cancel out any savings Canadian consumers might see if companies passed on tariff savings to them. Local governments in Canada will now be prohibited from applying domestic content quotas and other local development conditions to public tenders. The EU’s top priority was “unconditional access” to provincial and municipal purchasing for goods and services. It was not that EU firms were barred from bidding on infrastructure and service contracts before, but that Canadian municipalities retained some right to ask companies to give back to the community. When making public purchases, it makes sense for governments to encourage local spinoffs (such as taxes paid, wages, training for workers, opportunities for marginalized groups and other local benefits.) CETA will now preclude this for most purchases. This was also a unilateral concession to the EU. Meanwhile, U.S. cities retain the right to “Buy American” on infrastructure projects—a right they are not going to give up any time soon. Finally, the government still cites an outdated 2008 study that suggested the benefits of CETA to Canada’s GDP to be a $12-billion boost. A 2011 EU report suggested they might be half that. The only independent economic assessment of CETA based on the final text found that the deal would depress wage and job growth on both sides of the Atlantic, and eliminate tens of thousands of jobs here. The world economy is going through a period of slow growth. No one expects CETA to be much help to Canadian exporters outside a few sectors such as agricultural staples (seafood, beef and pork), and even these gains will be small. Far from being a counterpoint to Trump’s inward-looking, pro-corporate agenda, as Trudeau and several European leaders claimed today, CETA is itself a powerful tool for deregulation and generator of inequality. It will entrench an economic status quo that has concentrated wealth in the hands of a global one per cent and pushed disillusioned voters into the open arms of reactionary alt-right parties with the worst intentions. Stuart Trew is a CCPA trade researcher and Editor of the Monitor. Scott Sinclair is Senior Trade Researcher with the CCPA. Photo of today’s protest outside the European Parliament by Blair Redlin of the Trade Justice Network. • CETA: Why the big rush to ratify? Overall an enlightening read, but it’s hugely unnecessary to describe the chemical sector as a distributor of pesticides and GMOs. It oversimplifies the sector in an attempt to evoke disdain in the reader, and builds upon the negative stigma of GMOs. The negative stigma of GMOs is well warranted. Despite a systematic blockage of research into GMO impacts in the first place and a suppression of such research and its results once undertaken that should make anti-global-warming propagandists green with envy, the evidence has gradually become clear that GMOs in general have a number of negative impacts, both on the health of consumers, of ecosystems, and of the economics of food production. Meanwhile, for the patenters of GM crops, any benefits to their use are largely beside the point, which is rather to gain control over seeds through patents, ideally making it illegal for farmers not to buy from the only source. That and to increase the sales of herbicides and pesticides, since most of the more widespread GM products are those designed around enabling increased use of such products.